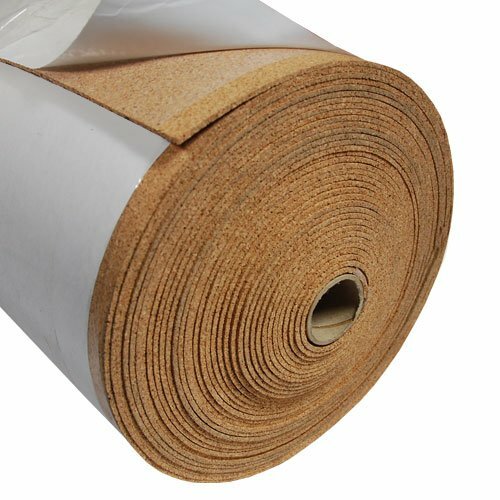 Our Cork Sheets can be used for moisture guards, vibration absorption, gaskets, washers, insulation, padding, underlay, modeling, bulletin board replacements, oil mats under vehicles, technical applications, etc. Our sheets offer a fine grain cork with excellent durability and are easy to handle. Easy to cut and shape; our cork is perfect for industrial, commercial and home use. All of our sheets are made with high tensile strength as well as solid compression to alleviate cracking. These sheets include a permanent pressure sensitive adhesive on one side for secure placement. Simply peel the liner and press firmly to the surface. This adhesive, for cork sheets with 1/4" thickness or higher, is meant to be laid on a flat horizontal surface. For vertical surfaces only use thicknesses of 3/16" or less. Allow adhesive to dry for 24 hours before walking on it. Available in different sizes.